recently, Manifest: Our Call to Faithful Creativity—is a regular contributor at The Huffington Post and is the Co-Founder and Editor-in-Chief of The Hillhurst Review. Ryan is a sought after commentator, panelist and pubic speaker on issues at the intersection of religion, faith and public life. 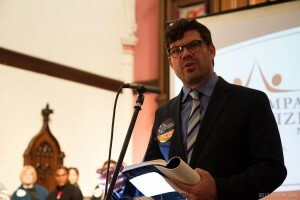 He serves on several interfaith organizations—including The Guibord Center: Religion Inside Out and the Abrahamic Faiths Peacemaking Initiative and LA Voice, a member of the PICO National Network. For the past 19 years Ryan has served as a pastor, most recently as the senior pastor of the Hollywood Seventh-day Adventist Church, since June 2005. He received his Master of Divinity degree from Andrews University in Berrien Springs, Michigan and a Doctor of Ministry in Missional Leadership from Fuller Theological Seminary in Pasadena, California. Ryan and his family live in Los Angeles.